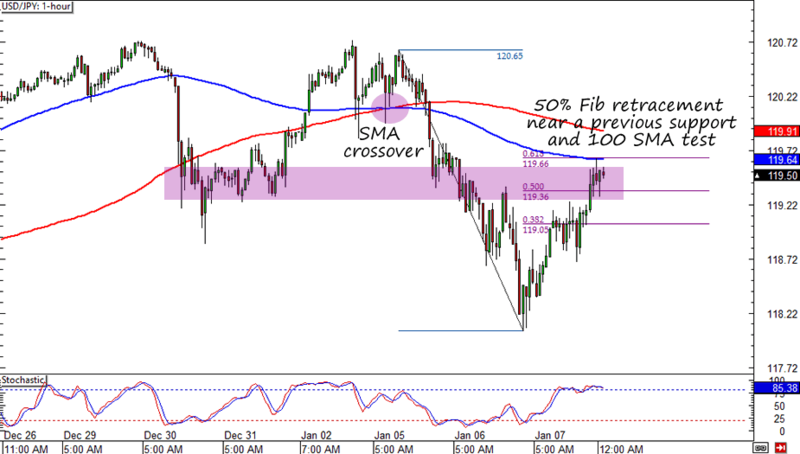 Forex Trade: Is USD/JPY Ready to Come Back Down? Is the Greenback losing steam against the yen or is it just retracing? Either way, this USD/JPY setup is sure making it easy on forex bears to attack! As I’ve mentioned in my Q4 2014 forex trade review, I made most of my pips trading USD/JPY’s uptrend. I’m still bullish on the Greenback in the long run, but this week I’m trading a short-term short bias. On USD/JPY’s 1-hour chart we can see that the pair is having trouble breaking above the 119.50 minor psychological area, which also lines up nicely with a 50% Fib retracement and a former support. Not only that, but the 100 SMA has just crossed below the 200 SMA! Fundamentally, I’m banking on the yen’s overall strength. Thanks to risk aversion in the European region and continued decline in oil prices, the low-yielding yen’s oversold conditions are harder to overlook. It also doesn’t hurt USD/JPY bears that Uncle Sam just printed a weaker-than-expected ISM non-manufacturing PMI report. According to Pip Diddy, the “ISM services PMI numbers clocked in its slowest pace in six months with the employment component showing its slowest growth since July.” Since some analysts believe that the ISM report is more correlated to the NFP report than today’s ADP release, it makes sense that some dollar bulls are holding back before the NFP release. I risked 0.5% of my account at 119.50 with my stop loss 150 pips away at 121.00. My initial profit target is at 118.00 for a 1:1 trade, but I’m willing to adjust depending on the strength of USD/JPY’s moves. I really want to be done with this trade (or at least secure a risk-free position) before the NFP release. This is why I’ll be watching this pair closely for opportunities to move my stop loss closer to my entry. I’m also open to just closing the trade though, especially if the pair hasn’t moved significantly by Friday.